The General Data Protection regulation (GDPR) is a set of laws enacted in the European Union (EU) in 2018. Privacy Shield is an agreement between the EU and US permitting the transfer of personal data from the EU to US. Privacy Shield is designed to create any program whereby participating companies are considered as having adequate protection, and therefore enable the transfer of information. The GDPR has specific requirements referencing the transfer of data out of the EU. One of these requirements is that the transfer must only happen to those countries considered as having adequate data protection laws. In general, the EU does not list the US as one of the countries that meets this requirement. This is an evolving regulatory mandate. At this point in time, Privacy Shield allows US companies, or EU companies working with US companies, to meet this specific requirement of the General Data Protection regulation. Privacy Shield was designed by the U.S. Department of Commerce and the European Commission to provide companies on both sides of the Atlantic with a mechanism to comply with data protection requirements when transferring personal data from the European Union and Switzerland to the United States in support of transatlantic commerce. Our certification demonstrates that DataBank’s practices meet or exceed the data privacy and security principles outlined by U.S. Department of Commerce and European Commission. DataBank demonstrated that its customer privacy procedures comply with the Privacy Shield Principles, which cover a range of requirements including Notice, Choice, Accountability for Onward Transfer, Security, Data Integrity and Purpose Limitation, Access, and Recourse, Enforcement and Liability. As a result, DataBank’s customers in highly regulated industries, where the company provides compliance architecture and audit support, can continue to be assured that their programs comply with these stringent privacy and security safeguards. DataBank takes on as much as 80% of compliance control management compared to 20% from some other service providers. We provide the tools and technologies required for compliance with economies of scale. We have expert staff to install it, calibrate it, configure it, monitor it, and operate it over the course of our engagement. This level of support drives operational excellence and governance while keeping your costs stable and predictable. 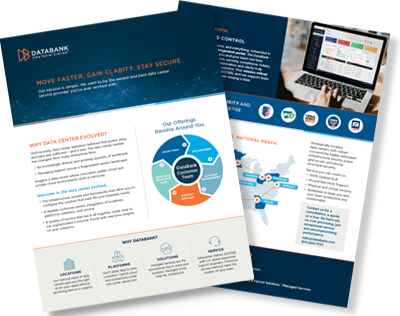 The DataBank Customer Portal provides a central repository of audit-ready documentation and provides a single source of truth for all of your compliance needs. Get everyone, and everything, connected in one simple to use management portal. Our sophisticated portal gives you and your team real time analytics into performance, security, compliance, tickets, devices and more. Communication and clarity truly enhance your compliance solution. See how we partner with you to design technology solutions that provide a secure, fault-tolerant environment, ensuring 100% uptime of your data, applications, and computing infrastructure. At DataBank, we find that doing things the right way the first time is the best way to achieve success. This starts with our consultative process. No hard sell, no over promising, just exceptional service and uncompromising performance.